A special thanks to Declan Fallon who painstakingly dug through our historical archives of Blogger Sentiment Polls and put together an interesting analysis. I wish we could take credit for this piece of work, but check it out at FallondPicks.com. We noticed yesterday that the the market's reaction to yet another China scare was very similar to the correction we saw at the end of February. The only difference in this case: TIME. Some of the S&P 500 members moved 2 or 3 percent on the day (CAT, DE & AAPL notably). Here is a list of S&P 500 stocks that moved 1% or more yesterday. Below we show the Dow Jones Industrial Average and compare each "correction." The Birinyi Newsletter, titled Reminiscences, is published and delivered on the last Wednesday of each month. That Wednesday happens to be today, and we're taking the time to inform our readers that both the Growth and Conservative portfolios (featured last week) are up 10% for the year. Newsletter subscribers have access to these portfolios along with the Birinyi Stock ratings, as well as Laszlo Birinyi's monthly market commentary and incite. Sign up today and receive your newsletter tonight. The Bears seem to be fully out of hibernation and dominate the poll this week. We want feedback from our readers. Tell us what you want, and how we can make our site more interesting to you. What is your investment strategy? What markets do you want to know more about? Let us know so we can help! We took a look at a sample of the fifty largest and fifty smallest stocks in the S&P 500 to see where these gains are occurring. We would assume that if there is a true shift from small to large, then the largest stocks in the S&P 500 would outperform, right? Below we have sampled the 50 largest and smallest names using Price, Cap and Dollar weights, in each case the larger stocks have underperformed by half. Curiosity and a fellow research guru prompted us to look back historically at a $1 investment in the S&P 500 under three different strategies. Beginning in January of 1966 we tracked the performance of the smartest strategy: removed the five worst days in the S&P each year, and the least smart (avoiding insult): removed the five best days each year. Each was calculated assuming the investor was to buy $1 worth of S&P shares, sell them before the day of the big move (+/-) and then buy back new shares the next day. They are both compared below to a simple buy and hold strategy below. Angle of Incidence...Equals Angle of Reflection? We struggled with physics this afternoon as the market seemed to defy gravity. The market is rallying now as sharply as it sold-off in February. The S&P 500 closed today at 1525.10, 11.8% above the 2007 low in little over a month! Take a look at the trend lines below. As part of our monthly newsletter service we include two, 10 stock portfolios. The Conservative Portfolio includes stocks priced below $100/share, are names we are familiar with, and have been seasoned in the market over time. We say they are seasoned because traders know what to expect and prices won't fluctuate wildly on rumors. They pay dividends, and as an individual you do not have to worry about watching your portfolio every day, because these stocks will not take you to the cleaners. Our Growth Portfolio contains, but is not limited to, more expensive names, the largest is over $200/share, the cheapest less than $30. The Growth stocks are not the seasoned names that appear in the Conservation Portfolio, but newer stocks offer more opportunities for profits. The Reminiscences newsletter is printed on the last Wednesday of each month, with updates to the portfolios as we see fit. 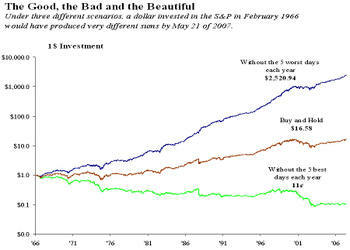 The table below shows the performance and top stock of both portfolios and the S&P 500 since the last newsletter was published on 4/25/07 (an investment of 100 shares in each stock is assumed).